The Honolulu Sharks of the Hawaii Winter Baseball League held their first practice yesterday at Les Murakami Stadium in Manoa. The Sharks are among the four teams that make up the new league, which opens its season tomorrow. 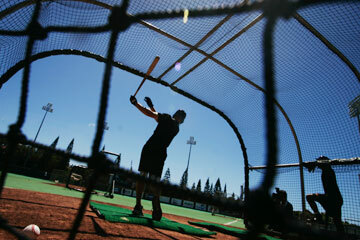 Duane Kurisu made himself a promise amidst the bustle of preparing for the return of Hawaii Winter Baseball. He's actually going to have fun at the ballpark this season ... or at least he'll try. "I think this time around I will make an effort to enjoy things rather than be caught up in the business issues that come up," said Kurisu, chairman and chief executive officer of HWB. "Professional sports and professional baseball, with so many games involved, it's a really, really tough business because you have so many different customers to please. So I will make an earnest effort to sit down and enjoy myself and enjoy the game like everybody else." Kurisu and the HWB staff haven't enjoyed much downtime lately, as they've been busy getting players situated while attending to the myriad details inherent in restarting a professional baseball league. And when the league returns tomorrow after a nine-year absence, Kurisu is anticipating a higher level of play than the league's first run (1993-97), which featured future big leaguers Ichiro Suzuki, Todd Helton, Jason Giambi and Derrek Lee. "We have more high-quality, top-line prospects in one season than we had probably in the whole five seasons," said Kurisu. "We have some incredible players who have been sent from Major League Baseball and from Japan. The quality of play is exceptional, and I think everybody will be able to see that." HWB returns to action in Manoa and Waipahu tomorrow, as the four teams -- the Honolulu Sharks, North Shore Honu, Waikiki Beach Boys and West Oahu CaneFires -- open their 40-game schedules. The Beach Boys and Sharks meet at Les Murakami Stadium, and the Honu and CaneFires play at Hans L'Orange field. Both games start at 3 p.m. The season runs through the championship game on Nov. 22. The league rosters -- which were still being finalized late into the week -- are primarily Single- and Double-A prospects. Seven first-round picks in Major League Baseball's First-Year Player Draft are among the players representing 21 major-league organizations and 10 Japan Pro Baseball teams. Each team will have a mix of players from U.S. and Japanese organizations. Three local products -- Kailua graduate Rodney Choy Foo and 'Iolani products Kila and Kala Ka'aihue -- are among the players assigned to the league. Choy Foo and Kala Ka'aihue are on the Sharks' roster, and Kila Ka'aihue is on the CaneFires' roster. Kila Ka'aihue probably won't play because of a knee injury. Honolulu Sharks players Rodney Choy Foo, left, and Kala Ka'aihue, both of Hawaii, attended practice yesterday for tomorrow's Hawaii Winter Baseball League opener. 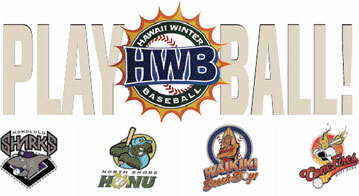 In its first stint, Hawaii Winter Baseball paid the players' salaries, giving officials the latitude to invite numerous players with Hawaii ties. This time MLB is handling the salaries -- a major factor in the league's return -- which means the commissioner's office has the final word in making the assignments. Also, some Hawaii players are in organizations that chose not to assign prospects to the league. "They're dictating who they're willing to invest their moneys in," Kurisu said. "So the three kids who are playing here are truly bona fide prospects, because the big league clubs have determined that these guys are prospects and they're willing to invest money in these guys to play here." The dugouts will also have a local flavor, with Lenn Sakata (Kalani) managing the Beach Boys and Mike Lum (Roosevelt) serving as a coach for the Honu. Kurisu said the league's reputation helped make HWB an attractive option for teams looking to develop their young prospects during the winter. He negotiated with MLB to keep the rosters at 28 players. Kurisu wants to keep the rosters at a manageable level to make sure the players get enough innings to improve their skills. "The teams wanted to send even more players -- we just couldn't accommodate them," he said. "I want this to be a terrific experience for the players. Not only outside enjoying Hawaii, but on the field." With HWB's return, Hans L'Orange has been spruced up to meet Major League Baseball's specifications. Kurisu credited the efforts of Walter Komatsubara and Zen Abe in grooming the natural-grass surface, and B. Haymon Co. for providing labor and equipment. Although HWB's contract with Major League Baseball calls for the league to be limited to Oahu for two years to facilitate scouting, Kurisu's long-term goal is to restore teams on Kauai, Maui and the Big Island. For now, though, he is simply looking forward to kicking back in the bleachers for a few hours. "A lot of these guys are going to end up being superstars," Kurisu said. "In the past we felt like these guys were going to be big-league players; we didn't know how large they would become. We know from experience that we have some Jason Giambis and Ichiros in this league." Tomorrow, Beach Boys vs. Sharks, 3 p.m.; Tuesday, Beach Boys vs. Sharks, 7 p.m.; Wednesday, Beach Boys vs. Sharks, 7 p.m.; Friday, Honu vs. Beach Boys, 7:30 p.m.; Saturday, Honu vs. Beach Boys, 7 p.m.
Oct. 8, Honu vs. Beach Boys, 3 p.m.; Oct. 10, Honu vs. Sharks, 7 p.m.; Oct. 11, Honu vs. Sharks, 7 p.m.; Oct. 12, Honu vs. Sharks, 7 p.m.; Oct. 13, Sharks vs. Beach Boys, 7 p.m.; Oct. 14, Sharks vs Beach Boys, 7 p.m.
Oct. 15, Sharks vs. Beach Boys, 3 p.m.; Oct. 17, CaneFires vs. Beach Boys, 7:30 p.m.; Oct. 18, CaneFires vs. Beach Boys, 7 p.m.; Oct. 20, CaneFires vs. Sharks, 7 p.m.; Oct. 21, CaneFires vs. Sharks, 7 p.m.
Oct. 22, CaneFires vs. Sharks, 3 p.m.; Oct. 24, Beach Boys vs. Sharks, 7 p.m.; Oct. 25, Beach Boys vs. Sharks, 7 p.m.; Oct. 27, CaneFires vs. Sharks, 7:30 p.m.; Oct. 28, CaneFires vs. Sharks, 7 p.m.
Oct. 29, CaneFires vs. Sharks, 3 p.m.; Oct. 31, CaneFires vs. Beach Boys, 7 p.m.; Nov. 1, CaneFires vs. Beach Boys, 7 p.m.; Nov. 3, Sharks vs. Beach Boys, 7 p.m.; Nov. 4, Sharks vs. Beach Boys, 7 p.m.
Nov. 5, Sharks vs. Beach Boys, 3 p.m.; Nov. 7, Honu vs. Beach Boys, 7 p.m.; Nov. 8, Honu vs. Beach Boys, 7 p.m.; Nov. 9, Honu vs. Beach Boys, 7 p.m.; Nov. 10, Honu vs. Sharks, 7 p.m.; Nov. 11, Honu vs. Sharks, 7 p.m.
Nov. 12, Honu vs. Sharks, 3 p.m.; Nov. 14, Sharks vs. Beach Boys, 7 p.m.; Nov. 15, Sharks vs. Beach Boys, 7 p.m.; Nov. 17, CaneFires vs Beach Boys, 7:30 p.m.; Nov. 18, CaneFires vs. Beach Boys, 7 p.m.
Nov. 19, Beach Boys vs. Sharks, 3 p.m.; Nov. 20, Beach Boys vs. Sharks, 7 p.m.; Nov. 21, Beach Boys vs. Sharks, 7 p.m.; Nov. 22, Championship, 7 p.m. Tomorrow, Honu vs. CaneFires, 3 p.m.; Tuesday, Honu vs. CaneFires, 6:30 p.m.; Wednesday, Honu vs. CaneFires, 6:30 p.m.; Friday, Sharks vs. CaneFires, 6:30 p.m.; Saturday, Sharks vs. CaneFires, 6:30 p.m.
Oct. 8, Sharks vs. CaneFires, 3 p.m.; Oct. 10, Beach Boys vs. CaneFires, 6:30 p.m.; Oct. 11, Beach Boys vs. CaneFires, 6:30 p.m.; Oct. 12, Beach Boys vs. CaneFires p.m.; Oct. 13, CaneFires vs. Honu, 6:30 p.m.; Oct. 14, CaneFires vs. Honu, 6:30 p.m.
Oct. 15, CaneFires vs. Honu, 3 p.m.; Oct. 17, Sharks vs. Honu, 6:30 p.m.; Oct. 18, Sharks vs. Honu, 6:30 p.m.; Oct. 20, Beach Boys vs. Honu, 6:30 p.m.; Oct. 21, Beach Boys vs. Honu, 6:30 p.m.
Oct. 22, Beach Boys vs. Honu, 3 p.m.; Oct. 24, Honu vs. CaneFires, 6:30 p.m.; Oct. 25, Honu vs. CaneFires, 6:30 p.m.; Oct. 27, Beach Boys vs. Honu, 6:30 p.m.; Oct. 28, Beach Boys vs. Honu, 6:30 p.m.
Oct. 29, Beach Boys vs. Honu, 3 p.m.; Oct. 31, Sharks vs. Honu, 6:30 p.m.; Nov. 1, Sharks vs. Honu, 6:30 p.m.; Nov. 3, CaneFires vs. Honu, 6:30 p.m.; Nov. 4, CaneFires vs. Honu, 6:30 p.m.
Nov. 5, CaneFires vs. Honu, 3 p.m.; Nov. 7, Sharks vs. CaneFires, 6:30 p.m.; Nov. 8, Sharks vs. CaneFires, 6:30 p.m.; Nov. 9, Sharks vs. CaneFires, 6:30 p.m.; Nov. 10, Beach Boys vs. CaneFires, 6:30 p.m.; Nov. 11, Beach Boys vs. CaneFires, 6:30 p.m.
Nov. 12, Beach Boys vs. CaneFires, 3 p.m.; Nov. 14, CaneFires vs. Honu, 6:30 p.m.; Nov. 15, CaneFires vs. Honu, 6:30 p.m.; Nov. 17, Sharks vs. Honu, 6:30 p.m.; Nov. 18, Sharks vs. Honu, 6:30 p.m.
Nov. 19, Honu vs. CaneFires, 3 p.m.; Nov. 20, Honu vs. CaneFires, 6:30 p.m.; Nov. 21, Honu vs. CaneFires, 6:30 p.m.